US-41 S toward Milwaukee. Exit WI-33 Allenton/West Bend (exit 72). Left on WI-33 6.5 miles, merge onto US-45 S. Exit Paradise Dr (exit 68) Left on Paradise 0.6 miles to S. Main St. Turn right on Main St. Rink is 0.5 miles on right. (From Milwaukee area) US-45 N... Stay right on US-45 at 41/45 split in Richfield. 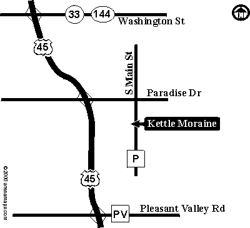 Take US-45 to Paradise Dr. Exit and right on Paradise Dr. Take 0.6 miles to S. Main St. Right on S. Main St. 0.5 miles. Rink on right.